High-quality gun hooks up to your compressed air and is designed to spray undercoating and rustproofing material. 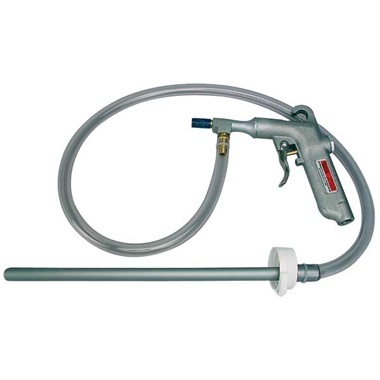 Gun includes pickup tube (10-1/2"L, 3/8" ID, 1/2" OD) and hose (approx. 38-1/2"L) so you can spray right out of the gallon jugs. Sprays amazing, looks great, easy clean up. I sprayed it with their cheap undercoating gun at 60 psi. You should wear a Tyvek suit and cleanup is super easy. Sprayed a Honda CR-V good with just under a gallon, one cost. Had to thin with lacquer thinner about 15% to get it to flow using undercoating gun. Texture was almost just like factory appearance. I wish I'd have found this years ago !! Got 2 1 gallon jugs for underside of Super Duty CCSB, have half gallon left. GREAT coverage, and easy to use with the Rusfre gun. Shoots straight out of the jug, set compressor @ 60 PSI at gun. I used to undercoat at a dealer, and this sure smells and looks like the same stuff. Definitely get a tyvek suit, head stocking and gloves. It WILL get all over you, not an issue when you're covered up. Wish I'd have found and used this years ago !. Great price and you get to do it yourself so know how well thing are covered. Service & Delivery comments: super fast delivery. LOVE TP tools for the fast shipping and GREAT prices !